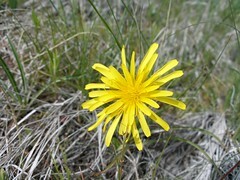 The microseris resembles a dandelion, with a leafless stem supporting a single head of bright-yellow ray flowers. The plant can reach of height of two to twelve inches. The basal cluster of leaves, narrow and strap-like with wavy edges, are sparsely to densely covered with hairs. Its flowering head closes early in the day, especially during hot weather, and the plant then becomes inconspicuous and non-showy. The flower matures to a dandelion-like seedhead and each of the seeds, or achenes, has a “parachute” that aids in wind dissemination.